This entry was posted on Tuesday, April 9th, 2019 at 9:09 am. PLANS for an exciting new community centre in Westbury have hit a major stumbling block. The building is currently owned by Wiltshire Council, but is being transferred to the Westbury Community Project, as part of an asset transfer. Exciting plans have been developed to convert the building into a vibrant community centre. Initially Wiltshire Council offered to bring the building up to a decent state of repair but now say they will be looking to pass it on in its ‘current state’. It means the local charity behind the project will have to pay for the works to make the centre useable. “I’m not happy, to put it mildly, I’m spitting feathers to be honest,” said project leader, Richard Hatt, who is also head of Westbury Junior School which borders the centre. “The centre has had fantastic support in the community – from local businesses, Westbury Town Council, the Area Board, local community groups; in fact, everyone except Wiltshire Council. “We were led to believe that Wiltshire Council would put the centre in a decent state of repair before they handed it over to us; now they want to hand it over in its ‘current state’. That means we will have to repair the boiler which isn’t working and pay for all the work needed after the recent vandalism. The bill will run into thousands and thousands of pounds and it’s money we simply don’t have. “We had a meeting with Wiltshire Council 18 months ago when they offered to help us with officer support. It would have been a huge help to us with things like grant applications. But then they said they would ‘loan’ us a member of staff for one day a week – but at a cost of £15,000 a year. Staff support would have been invaluable to us – and wouldn’t have cost Wiltshire Council anything – but at £15,000, it’s ridiculous. 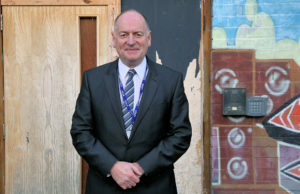 The building – Westbury’s former youth centre – closed four years ago after falling victim to Wiltshire Council dismantling its youth service. The hopes were to turn the centre into a vibrant community hub, offering space to local groups and organisations. Currently involved in the project are Wiltshire College, who would use the centre as an outpost, delivering training courses to all ages, Westbury Youth Football Club, Superstars – a club run for children in the school holidays, Westbury Shed, and Westbury Juniors and Infants schools. The centre could also house a community internet cafe, office space and be hired for use by businesses such as local pre-schools. The application for the community asset transfer has been made by the Westbury Community Project (Wilts). “I believe this community centre could act as a catalyst to improving the life chances of the community, not just the children, but the community. We believe we can change lives in the long term,” said Richard. “We want to enhance the community of Westbury, as we have felt that Westbury has been overlooked in recent years. We have created a project that is run by the community, for the community and are on the brink of something fantastic. But we need Wiltshire Council to do their bit and do what they said they would do – bring the building up to scratch before handing it over to us. I don’t think that is too much to ask when you look the support some other local towns are getting. Wiltshire Council were approached for a comment by White Horse News with a deadline of 12 noon on Monday; at 1.17pm, over an hour after the deadline, they issued the following statement and seem to have had a re-think. “Philip Whitehead, cabinet member for finance said: “We have been working closely with Westbury Community Group and from the start we have explained the building will need to have work carried out before it can be opened to the public. We have agreed to repair all the damage which was caused by vandals to the property before we hand it over so they are not expected to pay these costs. We continue to work with Westbury Community Project to explore the community asset transfer of the building.